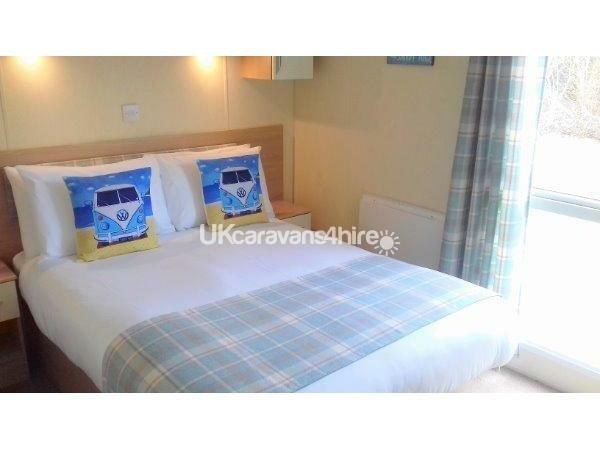 SUMMER BEACH CARAVAN SLEEPS 6 GUESTS VERY COMFORTABLY AND IS AVAILABLE FOR SATURDAY TO SATURDAY HOLIDAYS. Bank Transfer in to our Santander Bank Account. Payment can be made over the counter directly into our account at any Santander Bank. We kindly advise our guests that the caravan arrival time is 4pm and caravan departure time is before 10am. Upon our booking form we ask all our guests for their mobile contact number and if the caravan is ready before this time we will send a courtesy text to let you know. We are animal lovers but with regret due to the possibility of future guests having animal allergies we are unable to accept pets. Smoking is not permitted within the caravan but we do have ash trays available on the terrace. WELCOME TO SUMMER BEACH CARAVAN. 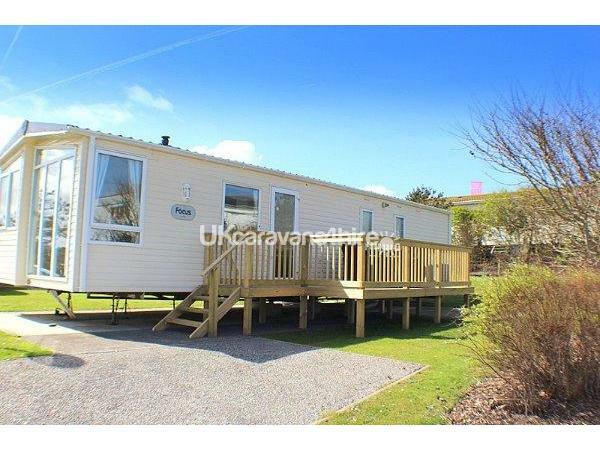 Summer Beach Caravan is a Platinum Top of The Range Luxury Caravan with Beautiful Master Bedroom Ensuite and has a Fantastic New Decking Area, situated In a Wonderful Large Corner Location yet only a gentle stroll to all the fantastic facilities the park has to offer. 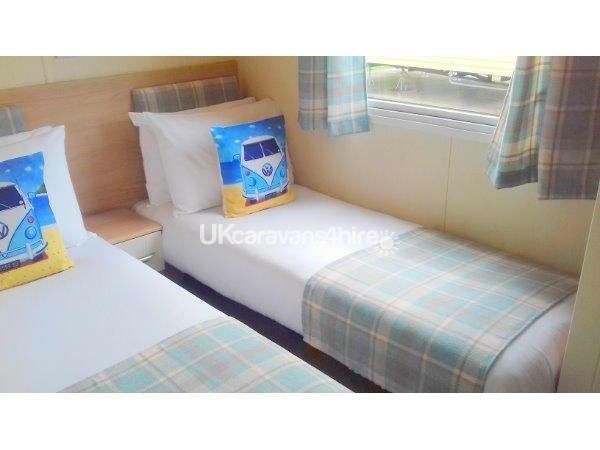 The caravan is perfect for all guests including families with young children & the young at heart too as all the parks facilities are only a few minutes leisurely walk away. Summer Beach Caravan is set in a lovely location and has no neighbouring Caravans to the right or behind, it is perfect for our guests who do not wish to travel in the car to the parks wonderful facilities. With Quality Crisp White Linen, Pillows and Duvets, which is wonderful so you can relax, put your feet up with a Nice Bottle of Wine & a Box of Chocolates with our compliments. There will also be a Drinks Welcome Pack containing Coffee, Tea, Sugar and Biscuits, if you fancy a nice cup of tea. We believe great service, attention to detail and a wonderful caravan in a fantastic location is what makes your holiday extra special. To make your holiday even more special there will be: Two Luxury White Bathrobes to snuggle up (for holiday usage), 2 Pairs of Hotel Slippers, Bathroom Toiletries, Toilet Rolls, and a Hairdryer too. FREE WIFI SERVICE, NEW BOARD GAMES, TOYS FOR OUR YOUNGER GUESTS, JIGSAWS, BOOKS, DVD SELECTION, CHILDRENS TV, CHILDRENS PLAY TABLE AND SEATING AREA. We have FREE WIFI SERVICE and a WII GAMES CONSOLE to keep them happy too (please bring your favourite games). 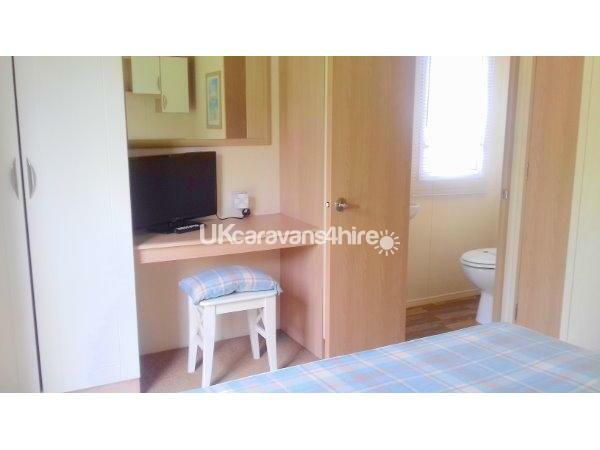 Summer Beach Caravan has Heating throughout, Double Glazing, New Large Flat Screen TV, & DVD player. There is also a New TV & DVD for Mom in the Beautiful Master Bedroom which also has Ensuite Facilities. Outside the caravan there is a BBQ especially for Dad. 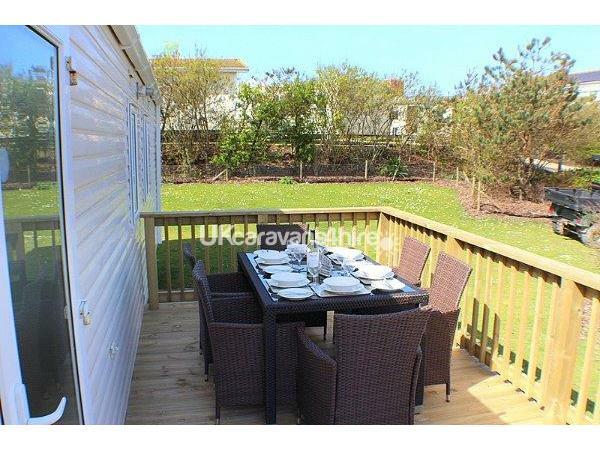 Leading directly from the caravan there is a Delightful Large New Decking area with Quality Dining Table and Comfy Wicker Chairs, this is the perfect place to sit back relax and enjoy a lovely meal in the sunshine with your family. Welcome to Summer Beach Caravan, and thank you very much for viewing our caravan today. We have been in business for over 30 years & pride ourselves on our excellent and professional service, ensuring our guests have a wonderful relaxing and stress free holiday. 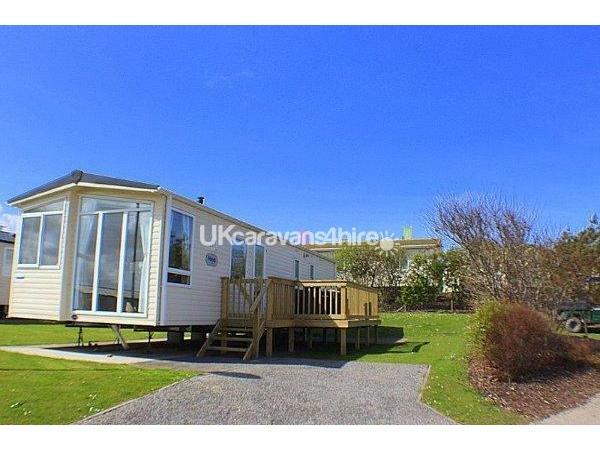 Summer Beach Caravan is situated in a lovely corner location in the Delightful Fairings area of the park, there is a tarmac parking space outside the caravan with path leading directly to the front door and decking area. To the right of the caravan there is a large grassed area perfect for sunbathing and the children to play safely. There is a Lovely BBQ especially for Dad which is located on a paved area perfect for alfresco meals. The wonderful large decking area is accessed via 3 steps leading from the garden directly to the caravan entrance. This area is furnished with High Quality Wicker Style Comfy Seating with cushions and Large Dining Table and is the perfect place to sit back, relax and enjoy a lovely meal with your family. To the side of the caravan there is a lovely garden area for the children to play under the supervision of their parents, who can sit and relax on the decking with a nice cool drink. 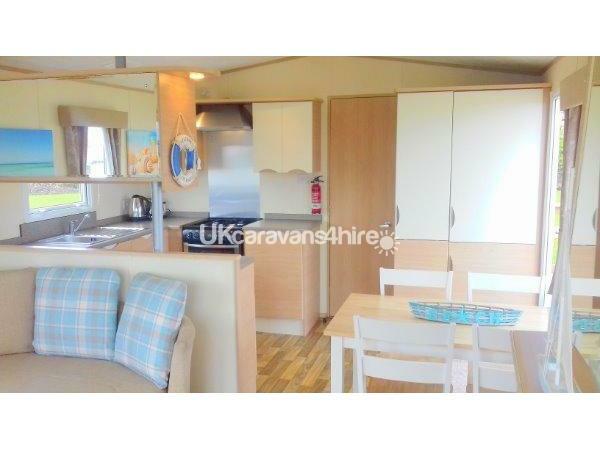 Summer Beach is an ABI Focus 38ft x 12ft Platinum top of the range Luxury Caravan and its detail, comfort and style has been designed to enhance your holiday experience. There are 3 Delightful Bedrooms, one Ensuite Toilet and Family Bathroom. Double Glazed with heating for your additional comfort. A newly constructed decking area leads directly to the entrance of the caravan, upon entering you will be delighted at the lovely light and fresh atmosphere and your eyes will automatically be drawn to the large windows where the sunshine pours in. The spacious contemporary modern kitchen has been very cleverly designed to provide a lovely light and open plan space to prepare your meals. The kitchen is very well equipped with everything you could possibly need including NEW NESCAFE DOLCE GUSTO COFFEE MAKER (don't forget to bring your favourite pods with you ) Integrated Large Fridge Freezer, Oven, Hob, Microwave, Toaster, Kettle and all Cooking Utensils. There is an Iron, Ironing Board and Vacuum cleaner for your personal use. The beautiful lounge and dining areas have been designed with both style and comfort in mind. There is a Dining Table and Four Chairs leading to the stunning lounge area with large windows. A door leads out to the Delightful Decking area. In the lounge the large seating area is very comfortable indeed with luxury fabrics and cushions. There is a lovely cosy central fireplace, a New Large Flat Screen TV with DVD Player and Wii Games Console (please bring your favourite games with you). There are cupboards containing an assortment of New Games, Books, Jigsaws and DVD’s to keep the whole family entertained. A door leads to a corridor where you will find a Lovely Modern Family Bathroom with Large Shower, WC, Washbasin and Heated Towel Rail. 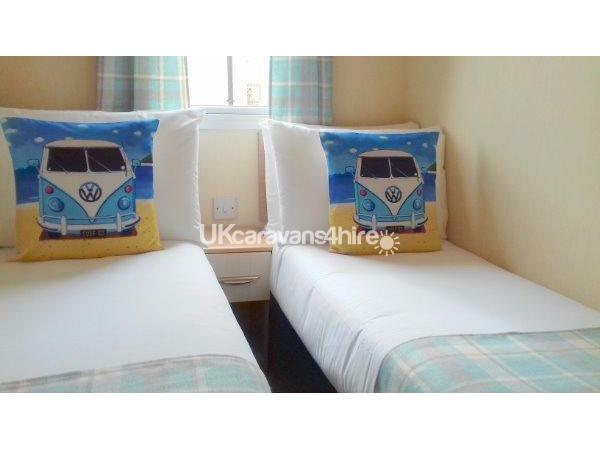 There are Two Delightful Twin Bedrooms with Quality Mattresses, wardrobe & heating. The beautiful spacious master bedroom occupies the entire rear area of the caravan with a large floor to ceiling window making the room very light and fresh. This room has been very cleverly designed to incorporate a Comfortable Double Bed with lovely wooden furniture including a New Television with DVD especially for Mom, a Vanity Unit, plenty of wardrobe storage and its own ENSUITE TOILET and Wash Basin. To make our guests feel very special indeed there will be 2 Luxury White Bathrobes (for your holiday usage), 2 Pairs of Hotel Slippers, Bathroom Toiletries and Hairdryer. including Quality Linen, Quilts and Pillows, Drink Welcome Pack including Tea, Coffee, Sugar & Biscuits, 2 x Toilet Rolls, Tea Towels and Bathroom Toiletries. Perran Sands Holiday Park is one of the best in England, having won many awards for its Fantastic Facilities and Wonderful Location. It is located in a spectacular location nestled in the sand dunes above the famous Perranporth Surfing Beach. The entire atmosphere of the park is very professional yet has a very relaxed surf vibe. The Surf Bay Restaurant is incredible, and there is even an original refurbished Volkswagen camper van in the centre of the restaurant, where families can enjoy their meal eating inside it. The park is very safe for children and the staff are very friendly making a lovely holiday experience. You can walk to the beach from the caravan down the coast path which takes approx. ten to 15 minutes and hire wet suits and surf boards. The beautiful Perranporth Beach is over 2 miles long and is perfect for the whole family. The village of Perranporth is only a 5 minute drive by car, taxi or bus and is a delightful seaside location, with lots of Souvenir Shops, Restaurants, Cafes and the famous Watering Hole Restaurant and Beach Bar is situated right on the beach, Parents can sit and enjoy a drink while watching their children have the time of their lives. Guests can be as active as they want or take it easy. The park has everything for everyone and includes: A wonderful Indoor Heated Swimming Pool with Water Flume, Outdoor Heated Fun Pool and Terrace, all weather Football and Basketball Sports Courts, Children’s Playparks, 4 Seater or Single Peddle Bikes to discover the park, Indoor Soft Play Area, Activity Centre, Adventure Mini Golf, Archery and Fencing. The famous Haven kids club has activities all day and evening to entertain the children. 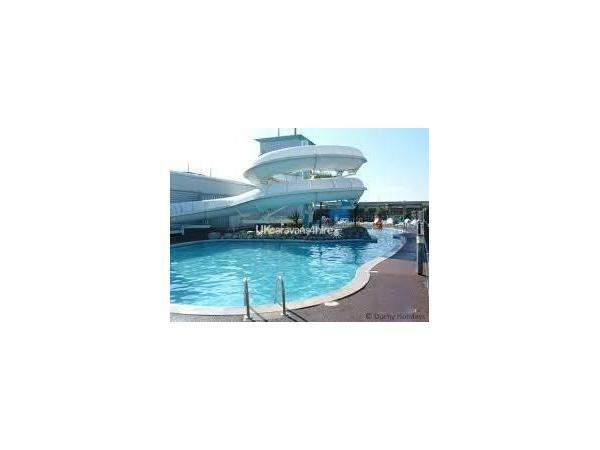 Wi-Fi is available free of charge in the Surf Bay Restaurant, Bars and Entertainment Venue. At Perran Sands there is a fantastic entertainment venue where younger guests can enjoy the Kids Club and meet their favourite characters, a large fantastic Amusement Arcade that has everything from 2p falls, Snooker, One Arm Bandits to the Latest Interaction Games. The entertainment venue in the evening is wonderful, doors open around 5pm, this large area is very stylish and has been designed to make every guest to feel very comfortable and relaxed. There are bars and a large stage where there is live entertainment every night from tribute acts, star performers, magicians and of course the Haven team who give 100% to make everyone happy. Passes are only required to enter The Amusement Arcade and The Entertainment Venue after 5pm and can be purchased from reception Adults £3.70 a day, Children £1.85 a day, Infants are Free. The fabulous Surf Bay Restaurant has been themed in a surf style and is incredible, the meals are very well priced and excellent, well worth a visit. There is also on the Park a lovely Fish Restaurant, Take Away Fish and Chips, Bistro, Bars and Papa John’s Pizza Takeaway who will even deliver to your table in the venue or your caravan. There is a lovely well stocked shop with Bakery and off licence where you can purchase your daily newspaper and groceries. Perran Sands is a dedicated family resort and their rules do not allow all male, female or hen, stag occupancy. Thank You very much for taking the time to view Summer Beach Caravan today and if you require any further information or have any additional questions at all please do not hesitate to contact us via the enquiry form on the website and it will be a pleasure to assist you. Additional Info: Guests do not require a membership pass during the day to enter the Amusement areas or Entertainment Venue, Passes are required after 5pm only. This is a fabulous park with lots of entertainment for all ages, you can be as active as you want, or just take it easy and relax! Guests do not require a membership pass during the day to enter the Amusement areas or Entertainment Venue, Passes are required after 5pm only..